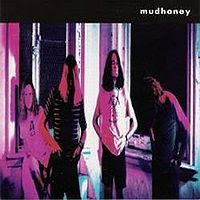 Mudhoney's first full-length may be, depending on your definition, the first really notable "grunge" album. After a string of singles and the half-step out of the gate that was the undeniably great (but overlooked at the time) Superfuzz Bigmuff EP, the band stormed into 1990 with this, a collection of 12 great songs that would forever give them the right to claim that they were doing this before anyone else. Of course, I'm sure you could make arguments for whether that's true or not, but to me, Mudhoney will always be the grunge band. Sometimes I think they're the only true grunge band. Sometimes I think the word "grunge" should never have been uttered. But it's usually credited to Mark Arm, so it's worth mentioning when you're talking about Mudhoney. Though this record came out in 1989, I wouldn't hear it until a year or two later, at which time we were snatching up anything and everything from this band and their Sub Pop cronies. And though they would make some huge leaps forward on their next album, this one still sounded great a few years after its release. Mudhoney is brilliant for a number of reasons, but I've always thought that a lot of it had to do with the fact that this, like Nirvana's Bleach or any of the pre-1990 Sub Pop stuff, was immune to any sort of grand pretense. The NW was still insular; the swarms hadn't descended, and this record reeks wonderfully of the efforts of some dudes with no higher expectations than to, if everything went right, be huge in Seattle and maybe get to tour overseas. Accordingly, the songs are rife with swearing, fuzzed-out beyond belief but entirely catchy, and smothered in sarcasm (I think). Of course, this pretty much sums up any Mudhoney record, but this one in particular is extra-snotty and really makes a point of harnessing aggression. But it's not sloppy. The songs are clearly carefully crafted, and there are few moments wasted. Really, there's not a bad song on this thing. Right from the beginning, you can tell that Mudhoney has upped the ante. The first 30 seconds of "This Gift" are musically more advanced than anything on Superfuzz Bigmuff, and as soon as the chorus kicks in, the brooding intro morphs into a ragged hook that really nails it. 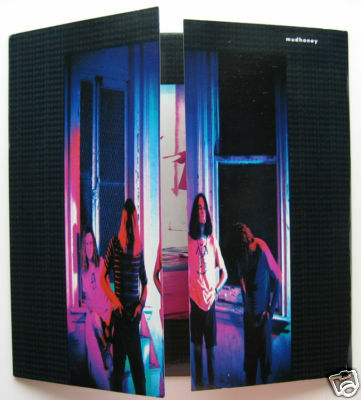 "Flat Out Fucked" is self-deprecating Mudhoney at its best, and "Get Into Yours" shows that they can indeed write a strong four-minute rock song. "You Got It" was a teenage favorite of mine, a really basic tune with hilarious lyrics, even though I still don't know what they're about. "Running Loaded" shows signs of the type of songwriting the band would embrace on their next record, and it really proves - not that it was ever in question to people who know the band's music - how versatile they are. The melody, the structure, everything - it's a great song. And the album is strong to the end, where they wrap it up with "Dead Love," the big closer. Not one of the better-known Mudhoney tracks, but a good one nonetheless. I just picked this up on vinyl, and scored an original copy with the split-in-the-middle gatefold cover that is unlike any other LP I own. And it still has the original poster on the inside. It is awesome. Everything about this record is awesome. I actually bought a Bill Withers album on vinyl years ago for no other reason then that it had that split cover look. Odd. This cassette got a lot of airtime in my bedroom as a teenager, although strictly in the headphones due to the swearing in a few songs. I agree wholeheartedly with your review so there is not much more to say other then that you didn't talk about "Here Comes Sickness," which has always been one of my favorite songs of theirs. It has everything that makes for a great Mudhoney tune: catchy guitar lick, uptempo pace, Mark Arm yelling, and lyrics that ride the line perfectly between genius and juvenile. Oh, and it has a rad album cover.